The truly sad part of this review is, this is what I consider a new band. Their last recording was in 2004. But hell, that was two years ago. And that was a major release. Their first was an EP in 2001. That was five years ago. This isn't a new band by any means. So it is mildly sad that it took me until this spring to find the band. Once again, thank gawd for Sirius. This is NOT a band you would hear on a regular radio station. And since well we don't really have a heavier music station here in Milwaukee anymore,I would have never heard them. They are trying to sell their music to fans, not advertisers. Looks like I have to track back in time and get the other CD now. 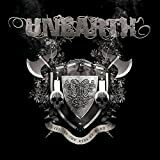 Unearth are heavier in the vocals than you would expect hearing the guitars. Guitar-wise, they remind me of Maiden. Remember a time when the guitars told the stories? You actually hear harmonies in this stuff. The vocals are raw and guttural, but not the chunk growl with death metal. Almost thrash vocals that are kinda like Phil Anselmo. The drums come hard and fast and brutal and at times almost march like. The drums on this band will be the thing to drive the pit at a show, not the guitars. Seems almost as if major life hell came down on the band as a whole when writing lyrics like that. Then again, I could be over thinking things. Reading too much into the picture. However I like to think the words have a little meaning to them. The song " This Time Was Mine" is about a family member of Trevor Phipps who was dying and the issues surrounding it and how it affected everyone involved. I love when lyrically, you get a piece of the people. Personal touch to the music is a great thing.